It is time for Massage Therapists to learn to collaborate in a new model of medicine. Palliative care is an emerging specialty in Western medicine that supports a person’s quality of life at every stage of illness. People who are facing life altering diseases or health conditions such as cancer often long for physical touch that can make a difference in their lives. Massage therapists are in a unique position to provide this type of support. Their passion for client-centered care and whole-hearted presence position them to provide integrative palliative care. It is time now in a changing and challenged health care industry for massage therapists to learn to collaborate in a new model of medicine. It is time to help define and strengthen massage therapy’s role in specialized medical care for people with serious illness. In this 150-hour training students will learn supportive therapies that can be used at any stage of illness. They will learn to blend gentle visceral and manual therapies with Eastern medicine- acupressure, abdominal massage, herbal infused oils and warm stones to assist adults, infants and children living with musco-skeletal, visceral, and neuropathic pain, GI dysfunction and immune suppression in both clinical and inpatient settings. Emphasis will be put on acquiring communication and problem-solving skills that enhance collaboration with Western medical providers in Adult and Pediatric Palliative care as well as in care of the dying. There will also be a strong focus on self-examination and self-care. In addition to acquiring diverse integrative skills to work with seriously ill and medically fragile populations in various settings, students will learn that the heart of this work opens the door to a spiritual practice that could change their lives. It is a 150 hour clinical training—and it is so much more. Three 5-day modules. Two will be held at the Santa Fe School of Massage, and one at a local hospital. Work with clients, writing, and on-line mentoring with Emilie and David. are a wonderful team. 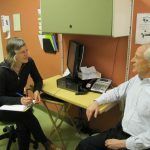 They have worked together for many years, and have together over 40 years of experience in both private practice and in-patient and out-patient adult and pediatric palliative care and oncology, as well as meditation and mindful movement practices. They are employed by UNM Health Science Center and UNM’s Center for Life, and maintain private practices in the integrative medicine community. We will also have several guest speakers over the course of the training—RNs, MDs and others who specialize in integrative palliative care. The minimum and maximum number of students for this training will be 10. This type of work is not just a new set of tools to add to your repertoire—it is a calling. If you feel called to this work we invite you to apply! Your application will be processed within 2-3 weeks and you will be notified by the end of that time. Upon acceptance, a contract will be sent to you and a $500 deposit will secure your place in the course. Download Application form here. We look forward to hearing for you!